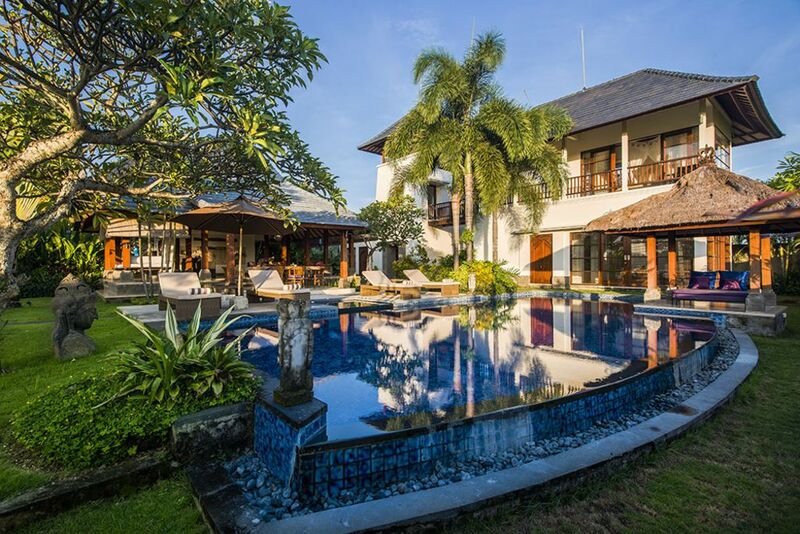 Villa Ayoka é uma vivenda de luxo 3 quartos localizado em uma bela aldeia de Kedungu - Tanah monte, perto do templo mundialmente famoso no oceano Tanah Lot e do campo de golfe de 18 buracos Nirwana Bali. A moradia tem campo de almofada, vista para o mar e quando o céu está claro você pode ver a beleza das montanhas. A moradia é projetado em um Bali - estilo joglo javanês, combinado com vivenda de luxo contemporâneo. A vivenda tem uma grande piscina de 15x5 metros e Jacuzzi com alguém em um lindo jardim tropical espaçosos, concebidos. Há uma torre de salão de 10 metros de altura, onde você também pode apreciar a vista de 360 ​​graus da aldeia. Dois dos quartos têm cama king size e um dos quarto tem duas camas de solteiro com possibilidade de colocar trilhos em torno da cama de solteiro para a segurança de seus adoráveis ​​crianças pequenas. Cada um dos quarto tem um banheiro privativo. O jantar e sala de estar estão situados sob a casa Joglo. A configuração cama existente é para 6 pessoas, mas pode acomodar até 8 adultos. O quarto é muito espaçoso, uma cama de solteiro extra pode facilmente se encaixam em cada quarto. A equipe está lá por 24 horas. O homecook pode ajudá-lo a preparar as refeições e também fazer o supermercado. A casa é perfeita para um feriado, é em uma área bastante, mas o hotspot turístico Seminyak é apenas 15 km da vila onde você pode encontrar as lojas, boutiques, clubes e restaurante na praia. Além disso, é fácil de organizar viagens a outras partes de Bali de Kedungu. Por exemplo, Ubud é de apenas 45 minutos de carro. WOW!!! Where to begin? We were a party of three couples and our week at Villa AyoKa couldn’t have been a more perfect introduction to Bali and all things Balinese. First, the location: We wanted a place outside of the cities; we wanted a beautiful and calm retreat after a day of sightseeing. Villa AyoKa was perfect. It is situated in the middle of rice fields on the edge of a tiny, non-touristy village. At 6 a.m., you could hear music and chanting drifting over the rice fields from the temple, while the smell of flowers and light field smoke wafted over you. It was enchanting. There is one fun and funky bar/restaurant about a 15 minute walk towards the beach, which offers a variety of drinks and good food. We, however, did most of our dining at the villa. We were fortunate to experience two Balinese rituals/celebrations (a funeral and a three-month baby celebration), which would have been very unlikely if we had stayed in a different type of accommodation. In spite of being out of the city, with the availability of a driver and car just a request away, we were able to explore many of the wonderful natural, cultural and culinary delights Bali has to offer. Second, the villa itself: Gorgeous comes to mind. The villa is enclosed in its own garden with living/dining open to the air but under the protection of lofty Balinese roofs. Two of the bedrooms are spacious, king-bedded rooms with lots of storage space; the other twin-bedroom is smaller with not as much natural light but is still a lovely room. The swimming pool is large and very welcoming after a day exploring. The photos of the villa and garden are very accurate. Finally, and most importantly, the staff: Oh, my goodness, were we ever spoiled. There are six wonderful people who took care of us at the villa: The property manager, the cooks, the housekeeper and general handyman, the gardener and pool man, and a security person. The warmth, kindness and generosity of spirit that all of the staff showed us made our stay unforgettable. The explained the celebrations we witnessed; many of them lived in the village and could tell us who everyone was. Unbelievable. We were made to feel like part of their families. We all had rather large lumps in our throats when we had to say goodbye. We cannot recommend Villa AyoKa too highly. We were very touched, it was a very beautiful experience that you shared. Hopefully your review can be a guide for our future guests. Thank you for choosing to stay with us, we sincerely hope to welcome you as our special guest in the near future. Beautiful villa and pool with attentive staff in peaceful surroundings. We stayed for 5 nights in mid July with our family of 4 - including 2 young boys, 5 and 7. We were immediately impressed with the property, beautiful and large pool, well maintained gardens and chilled out living area (which is all outside/covered). The rooms were very spacious and bathrooms exceptional. Note they are detached. Staff were excellent, available when needed but discreet enough to ensure we never felt like we had no privacy. We ate around half our meals in the villa and the other half at local restaurants in Canggu. We used the local driver (semi attached to the villa) which is a must if wanting to get to Canggu village and enjoy the great selection of restaurants/shops etc - some 20-30 mins drive (always more coming back for some reason......). We walked to the nearby beach with kids which was a fun, meandering 20 min excursion, catching a bit of local village life. Kedungu beach is much quieter than Canggu beaches, with good but strong surf and rips so caution required when swimming. There is a good restaurant/pub near beach with good western food, drinks and beautiful sunset viewing. Overall we rated this property very highly, it's not in the middle of the action, but perfect if you are wanting relaxing time with friends/family in a stylish villa with great pool environment. We were lucky to have spent holidays at Villa AyoKa, the villa is beautiful and the facilities are excellent. All of staffs were very help full and we were made to feel very special. If you want a relaxing holiday where you are treated like royalty away from the usually holiday then I would highly recommend you book to come here. We will definitely be back. Amazing place to stay in. We had a great stay in villa ayoka. The staff were very welcoming and we enjoyed their company. Katut's and puto's cooking was excellent and Wayan did a good job cleaning the rooms. We will come back here again when we come back to bali. I highly recommend this villa it was clean and had excellent service. Amazing, quiet off the grid hideout for R&R! We traveled with friends a group of four and spent 10 days at Villa Ayoka Jan19-28/16. On arrival we were greeted with a cool refreshing drink, the staff made us feel like we instantly belonged and they were always at our beck and call. The villa was beautiful, clean, spacious, the grounds manicured, lush and inviting. Pool and jacuzzi clean, well maintained, loungers, hammock, and day beds comfortable. The food was amazing. Our wish was to experience the Balinese cuisine and the staff did not disappoint. Fresh fruit and fruit juice served daily. Main courses always hot and delicious, preparation and presentation excellently mastered. Desserts too were very tasty, deep fried bananas and ice cream a must if you visit. The cook always informative of what we were being served. We never pulled away from the table hungry. The villa was meticulously cleaned daily, the staff always very discreetly cleaning around us respecting our presence. Bed linen and towels changed every few days and always smelled so fresh and clean. Staff were courteous, informative, friendly, accommodating, helpful and always willing to spend some extra time with us to explain, plan and organize our day trips. We spent a day in 'Ubud' shopping, toured a batik factory, gold and silver outlet, coffee and cocoa plantation, bartered at a local market. From the villa we walked through rice fields to Tanah Lot temple with one of the villa staff who gave us detailed information along the route. We all had a massage within the comforts of the villa. We walked down to the ocean and enjoyed the sights and sounds of the locale people who readily returned smiles and a friendly hello. If your looking for a quiet off the grid hideout for rest and relaxation, look no further this location is sure to please. Villa Ayoka está localizado em uma área bastante de Kedungu, 5 minutos de bicicleta para o mundialmente famoso templo do lote de Tanah sobre o mar ea 1 km da praia Kedungu onde você pode juntar os surfistas se misturam na onda. Há muitas coisas para fazer e ver na área, tais como parque de borboleta, Templo Tanah Lot, Bali Kecak dança do fogo, 18 buracos de golfe, ciclismo, bodyboard, surf, passeios a cavalo, pesca, andando através da vila, fabricação de cerâmica, yoga, fitness e algumas outras coisas. O famoso turístico área lotada de Seminyak é de apenas 15 km de distância da vila e da beleza da vila arte Ubud pode ser alcançado dentro de uma hora a partir da vila. Em Ubud, você pode fazer rafting, visitar floresta macaco, o campo de arroz terasiring cênica, galerias de arte, etc. The prices above are for 2 bedrooms / 4 person occupancy. > 3 bedrooms / 5 or 6 person the rate per night in low season is 180 euro and in high season 220 euro. > Extra (adult) bed the surcharge is 15 euro per night. > Surcharge for a baby cot is 5 euro per night. For payments through Home away or other credit card service providers there will be a surcharge of 3%.